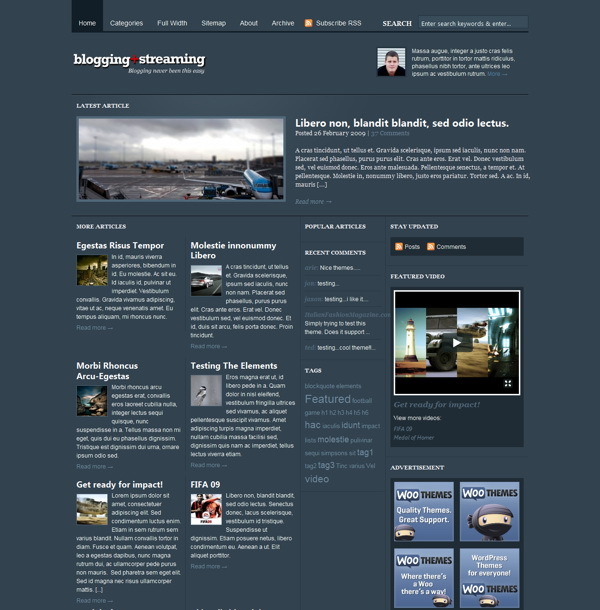 Bloggingstream caters to both those irregular personal bloggers, as well as the more serious publishers. The theme, which sports a nifty, integrated lifestream and sidebar video player, can be used for personal blogs, whilst also satisfying your online magazine needs. The 7 ad spaces definitely contributes to the bottom line as well. The theme offers 2 different layout options for both the featured area, as well as the header, 7 ad spaces (468×60, 300×250, 125×125) in total, sidebar video player, integration of a lifestream, 2 widgetized areas (homepage middle column, site-wide sidebar), 8 custom Woo widgets and 11 great color schemes to suit your site identity. Making simple changes without editing code, like adding your own logo, changing to an alternate color style, adding Google Analytics code, couldn’t be easier with the back-end theme options panel. The theme is compatible with all the modern web browsers like Firefox, Safari, Chrome and Internet Explorer. There is an image resizer script built into the theme framework to automatically scales your post images for pixel perfect display in our templates. No need to upload new cropped images when re-designing your website. It comes packaged with a .po file for easy WordPress theme translations into your desired language – editing one neat little file without hunting down text in the theme templates.